In our house we love coffee, the kettle is always boiling! 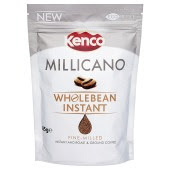 So when I was contacted and asked if I would like to review, 'Kenco Millicano Wholebean Instant coffee', I was like me?.. Coffee?.. Of course, there was no doubt about it! Kenco has been producing great coffee for 88 years, that says it all doesn't it? Must be lovely coffee! 'Every cup of Kenco helps coffee growing communities earn more and live better'. Everything they do at Kenco is about bringing us the perfect coffee experience. 'For some people it has to be smooth. Others like it rich and fruity. However you like your coffee, you’ll be spoilt for choice with Kenco. We’ve delicious blends of coffee, pure coffee from a single country, expertly blended decaff, creamy cappuccino or caffé latte, and our brand new wholebean instant – the closest thing to proper coffee in an instant. So what will it be'? The first thing that made me smile about this coffee when I seen it was the eco refill pack it came in, very handy indeed! We was off on holiday so was pleased the coffee arrived in time to pack in the suitcase. If it was a jar there would of been ifs and but's with it being in the suitcase, but no, it was a packet! No problems at all. This coffees 'clever combination of instant coffee and finely milled coffee beans' ment the cups of coffee we were drinking were delicious, they weren't too strong in taste and were smooth as smooth can be! The beans made to make this coffee are 100% sourced from Rainforest Alliance Certified farms. This coffee comes a refill packet 85g and also in a tin 100g. These can be purchased from a wide range of local shops, large supermarkets and also online stores! Amazon sell 6 refill packs for £17.94 and that includes free delivery within the UK. A lovely coffee, I would highly recommend!